Silicon Valley is in mourning today for one of its biggest heros -- Steve Jobs. Unless you've been hiding in the basement of an art museum or stuck in rehearsals for a play over the last 18 hours or so, you will know that the Apple co-founder and chief lost his battle against cancer last night at the age of 56. The news came in when us Knight Journalism Fellows at Stanford were just finishing up a seminar. Since then, many of the members of my group have been watching the news unfold intently. There are a number of general assignment and tech reporters among us. It must be strange to have something of such import happen on your beat when you can't really cover it. (One of the tenets of the Fellowship is that we're not supposed to do much if any regular journalism work while we're here for the year.) But I expect some of our number may have been called upon to supply some kind of coverage for their home news organizations. It was surreal walking around downtown Palo Alto last night. It was business as usual at the Apple Store on University Avenue. 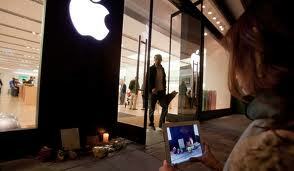 People stood outside taking photographs and placing floral and homemade card tributes under the big white Apple logo. Inside the store, by contrast, employees in blue T-shirts continued to sell shiny pieces of digital equipment to customers as if completely ignorant of the passing of the man who made their paycheck possible. "If I were the manager of this store, I would be throwing a big party for employees and customers to celebrate Steve Jobs' life right now, not continuing to sell stuff," the friend I was with said. "The uninterrupted commerce is weird." This morning there was a framed photograph of Jobs at the front desk of the main Stanford gym. Even if the Apple store in Palo Alto isn't acknowledging this key moment in the company's history, it seems the news has affected much less likely corners of the local community.